This one sounds like a good option for someone looking for a good beater. 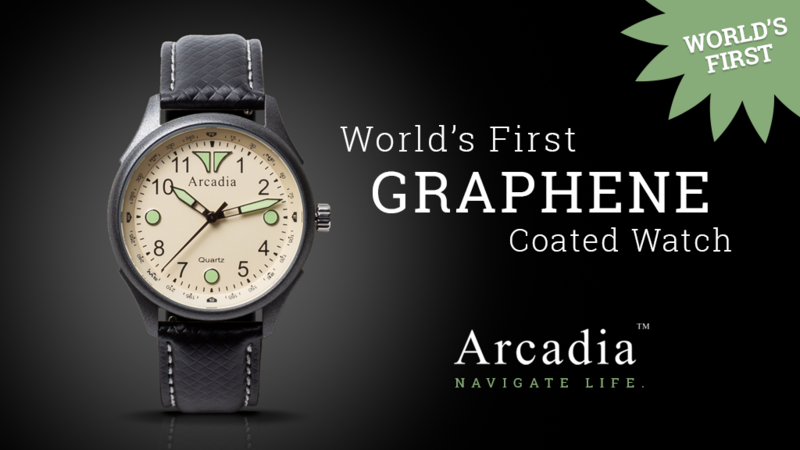 Arcadia Watches is coming out with their G1.0 field watch which is the world's first to offer a graphene coated case. There are no early bird levels, but if you join the Kickstarter, you'll get the graphene version of the field watch for $199. Retail will be $349. If graphene isn't for you, the stainless steel version is $129 with Kickstarter pricing, going up to $189 for retail. 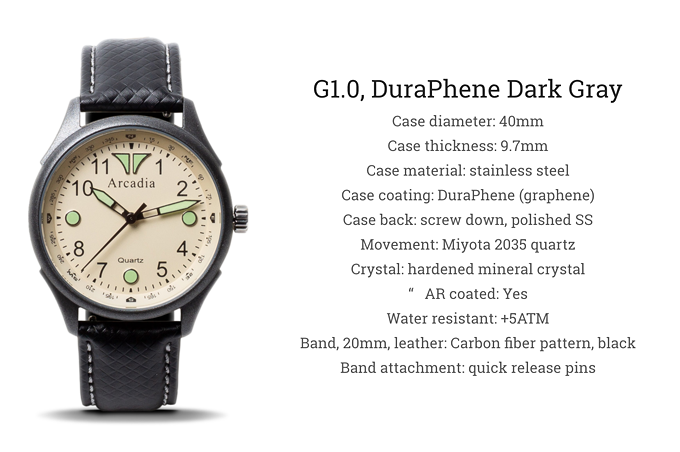 Arcadia is using “DuraPhene," aproprietary graphene coating, that is fused to the case (inside and out) offering the ultimate case protection. However, this amazing material is also expensive…around $100/gram. But it provides uber watch protection and, well…it’s just cool. 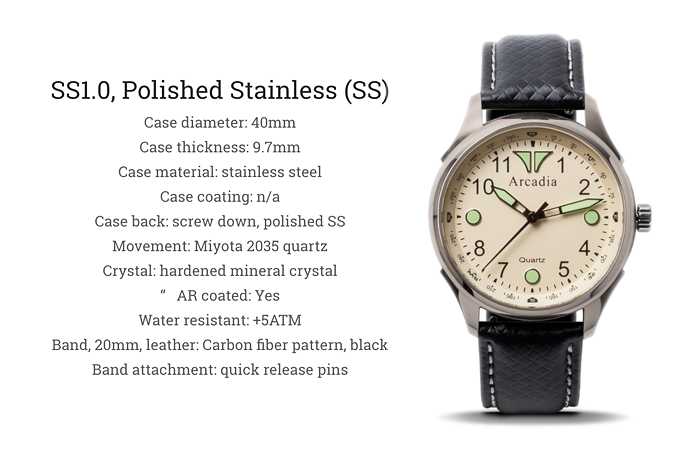 The important thing is that we are now able to offer the Arcadia Field Watch with one of the planet’s strongest materials fused to the watch case. So now, you just might have a watch that is beyond durable and can hold up to Superman! Last edited by TheJohnP on Mon Apr 15, 2019 9:58 am, edited 1 time in total. The graphene is really cool, and I think could be the future of watch cases for those that would like better scratch resistance. What's not cool: They are using a superhard material on the case and then NOT giving it a sapphire crystal. Why would they not charge a little more and do that? That's exactly what I thought. I started in this watch habit with mineral and learned quickly that they scratch to easy. Nothing but sapphire for me now. I have a beautiful seiko with black dial and silver accents that has a couple of scratches on the crystal, it bothers me. No doubt. How hard would it be to seal it up to at least 10 ATM, so you wouldn't be worried of washing your hands in a stream while hiking? Actually, I've never understood why most field watches don't have a screw down crown to give it some good water resistance. I guess watch designers are thinking of outdoor use as the trek to your car from your office or that long hike taking your dog for a walk around the block (lol). Mineral glass = dealbreaker. I have only two watches that are mineral glass...they are the two with the deep scratches I cannot remove. The fact that this microbrand is hyping their space age case material and then using mineral glass tells me they ae not true watch people and this is little more than a marketing gimmick. This has to be THE fugliest watch I have seen in a while. But didn't seem too many were, hence not meeting their all or nothing goal.